The Trans Pecos is perhaps the most complex of all the regions. 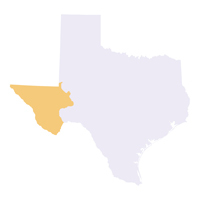 It occupies the extreme western part of the state eastward generally to the Pecos River. This is a region of diverse habitats and vegetation, varying from the desert valleys and plateaus to wooded mountain slopes. Elevations range from 2,500 feet to more than 8,749 feet at Guadalupe Peak. Even the mountain ranges vary greatly in the environments they offer for plant and animal life. Some are characterized by volcanic rocks, others by limestone. Due to the diversity of soils and elevations, many vegetation types exist in the region. The principal plant communities are creosote-tarbush desert scrub, desert grassland, yucca and juniper savannahs, and montane forests of pinon pine and oak. The various subregions reflect the diversity of the Trans Pecos. The Sand Hills area consists of shin oak and mesquite on wind-blown dunes. Flat-topped mesas and plateaus are intersected by steep-walled canyons and dry washes that comprise the Stockton Plateau. Soils with high salt content and gypsum dunes are typical of the Salt Basin area. The Desert Scrub subregion is an area of low rainfall and rapid drainage. Creosotebush flats with yucca, lechuguilla, and various small-leafed plants are common. The Desert Grassland area occurs in the central part of the region and is characterized by deeper soils with high clay content. Finally, the Mountain Ranges have higher rainfall and woody vegetation such as junipers, oaks, pinon pine, ponderosa pine, and Douglas fir. These plants have been identified as particularly worrisome terrestrial invasive species in the Trans-Pecos ecoregion. Click on their scientific names to go to the Invasive Plant Database and learn more.